Looking for a pumpkin pie dish? One with a decent capacity? Or, maybe any of the many styles of baking containers? 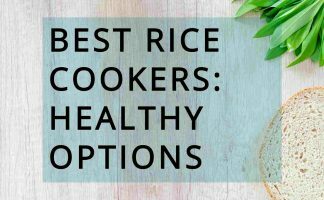 It’s hard to compare them all, but here is a buying guide with a selection to help you find the best bakeware set for your needs. 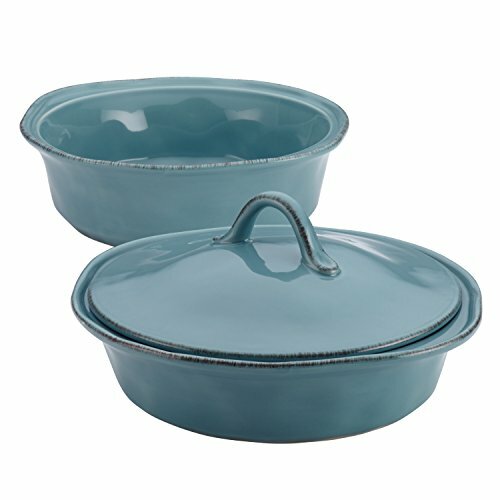 The main reason people choose the ceramic bakeware sets over others (such as stainless steel, enameled cast iron, or borosilicate glass) is that they are stylish, versatile, and hold and distribute the heat well for nice and even cooking of the food at the center and browning and crusting of the edges. Also, they don’t leach metals or other contaminants that might taint your food. About ceramic bakeware…There are two ceramic bakeware types. 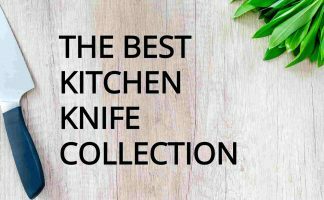 One is the nonstick ceramic type that has a ceramic coating somewhat like that of the ceramic nonstick cookware sets and frypans. If you love homemade cookies and cakes but dislike having to grease the pans every time, then you’ll want the best non stick bakeware to make baking a whole lot easier and enjoyable. The thing about ceramic is it is PTFE-free. And then, there is the traditional bakeware, the one that is ceramic throughout, similar to the pure ceramic cookware. If you love home roasted foods, casseroles, or pies and flans, you’ll want the best casserole cookware, baking pan, or pie plate in this range. What’s good about this range is its durability and style. 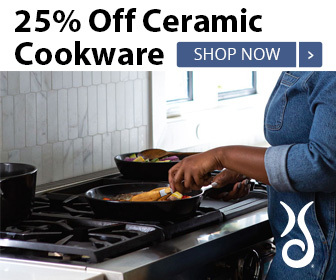 This selection includes pure ceramic bakeware as well as the nonstick or hybrid type. I focus on ceramic material in oven cookware and this includes non stick cookie sheets and cake pans, and ceramic pie and casserole dishes. This baking dish is made of Emile Henry’s high-resistance oven ceramic, based on their state-of-the-art technology. It can be used in the oven to temperatures up to 520ºF. This pie dish is perfect for deep dish pies. And that pumpkin pie! It is dishwasher safe, microwave safe, and can go directly from freezer/refrigerator to a hot oven. A beautiful and extremely hard glaze is a feature of this bakeware. The pie dish has a fluted edge and is ideal for pies, quiches, and gratins. It is easy to clean and comes with a 10-year warranty. The even heat distribution and retention mean crusts bake evenly and nicely and the interior is baked to perfection. The weight, height, and thickness of this pie dish and the angle of its sides make this bakeware a pleasure to use. This product is manufactured in France by Emile Henry, who pride themselves in making the finest quality ceramic ovenware that includes the best bakeware sets on the market. Looking for the best bakeware brand? Emile Henry is one of the few ceramic bakeware brands that have been manufacturing ovenware for over a century. The Henry family carefully hand-craft their products and have been making some of the best casserole bakeware for over 150 years. Attractive. Fluted edges. Heats evenly for a crusty pie. 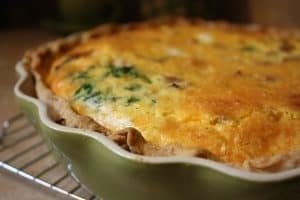 A good size for pies, quiches, and gratin. Comes with a 10-year warranty. As with all opaque pie dishes, the crust beneath the surface can’t be seen to know when the base of the baked goods is perfectly browned. Experience with use will help. 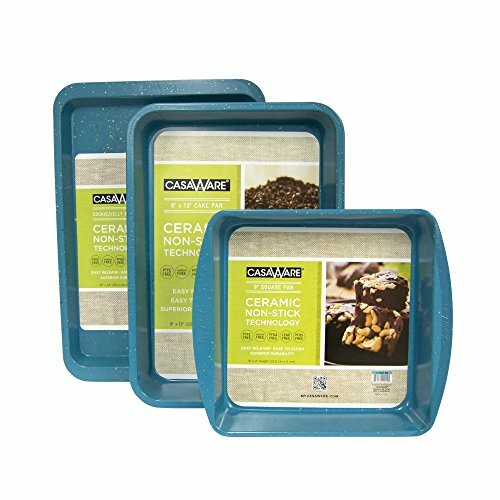 Looking for ceramic bakeware sets with lids at a price that’s affordable? This Rachael Ray 3 piece bakeware set contains a 1½ and a 2 qt casserole dish with lid. It comes in a stylish rustic look with the cool Agave Blue color. These are versatile because each can go from the oven to your table. And leftovers can be stored in the same container in the refrigerator. Stoneware is another type of fired ceramic ware. This product is oven safe to 500°F. The ceramic bakeware with lid is versatile and can also be used in the microwave and for not only storing in the refrigerator but also the freezer. It is dishwasher safe. The Rachael Ray brand is distributed by the Meyer Corporation with manufacturing facilities in the US, Italy, and Asia. Fresh color. Easy to clean. Versatile. A bargain for the price. Some reviewers claim the bases are a little rough. Best to place on a heat mat or board. The lid is loose fitting, so take care when transferring from oven to table or to refrigerator. This set contains non stick ceramic bakeware that includes a 7″ x 11″ x 1.5″ baking pan, a 9″ loaf pan, and a 12-cup muffin pan. This 3 piece nonstick bakeware is stated as having a heat tolerance to 536ºF. These blue granite pans have a 0.6 mm steel inner and a ceramic coating that gives them the nonstick effect. The coating is deemed free of toxins, cadmium, lead, PFOA, PTFE, and PFOS and is FDA, California Proposition 65, and EU approved. The ceramic non-stick technology from the CasaWare Company makes this set very easy to clean and the food slides off easily. The exterior has a ceramic coating while the interior coating is a textured ceramic nonstick type. Can be used in a toaster oven as well as a standard oven. Not for the microwave. Has good reviews about quality for the price. Will be easy to clean by hand. There is no need to grease the pans as the baked goods won’t stick and should glide out of the pans. Seller advises to not immerse these in water (assuming this means soaking them). Advertized as suitable for toaster ovens but best to check sizes as toaster ovens vary and the loaf pan and the baking pan are too large for some to fit nicely. CasaWare also make a ceramic cookie sheet and baking pan set that matches. 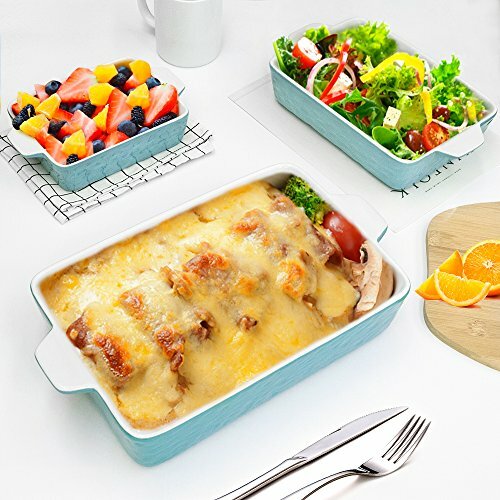 This is a rectangular baking pan set features a ceramic glaze with wavy accents on the exterior of each of the non stick ceramic baking dishes. The interior surface comprises a creamy hybrid ceramic coating, which makes the surface nonstick. The benefit of this, of course, is that there is no need to grease the dishes! and backed by a very easy cleanup. The seller claims ceramic nonstick coating resists flaking and chipping and reviewers confirm that it is long-lasting. The brand, Krokori, is a product of the Genol company, a ceramic manufacturing specialist in Chaozhou City, the city known for its ceramics. The company was founded in 1995. The 3 piece baking tray set includes a large, approx. 12 x 8 x 3 inches (30 x 20 x 7 cm), one medium, approx. 9 x 6 x 2.5 inches (23 x 16 x 6 cm), and one small dish, approx. 7 x 5 x 2 inches (17 x 13 x 5 cm). This product is oven safe to 500°F. The handles are double ear designed meaning easier to hold. It is versatile and can also be used in the microwave and for storing in the refrigerator. However, it is not suited to use with direct flames or an induction cooker. The bakeware can nest within each other for storage, saving space. Fresh color. Attractive design. Durable. Versatile – great for parties. Very affordable. Not for induction ovens and avoid direct fire. It is best to avoid metal utensils. Though, the food should easily slip out without the need to reach for these. I’ve included this one here for those who are looking for the nonstick pans and considering the hybrid ceramic bakeware. SilverStone is owned by Meyer, the largest cookware distributor in the US and second largest in the world. No need for non stick spray or oils with this hybrid ceramic bakeware set. In fact, you should avoid them to maintain the non stick benefit. Similarly, avoid putting these in the dishwasher. It takes two seconds to wipe clean it clean, so why would you? The Silverstone 9″×9″ cake pan is oven safe to 500°F. It is available in chill red or marine blue. Both add a spark of color in the kitchen. The rolled-rim carbon steel construction of this baking dish means it shouldn’t warp. The non-stick surface means easy cleanup and absolutely no greasing of the pan needed. That’s one thing to be elated about when baking cakes and cookies. Beautiful color but expect the bottoms to get scratched a little. Because its metal, the bottom can get hot – something to watch. No need to grease. Baked goods slide out of pan easily with the nonstick properties. Easy to clean by hand. Durability. Best to avoid metal utensils or baking at high temperatures to lengthen the durability of the coating. 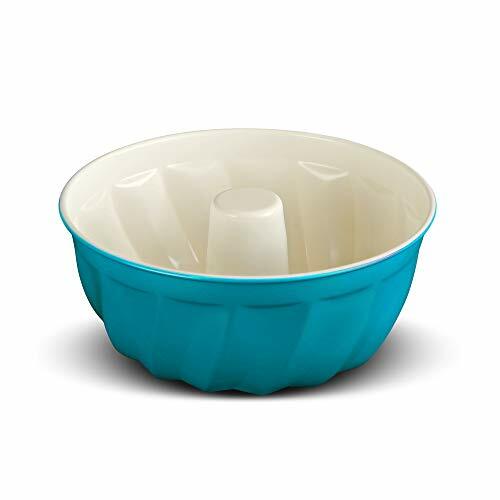 Here’s another one from the CasaWare company with nonstick properties that are toxin free — a 9 by 4 inch ceramic bundt cake pan, or otherwise called a fluted cake pan. In a fresh color, this ceramic coated fluted cake pan is very easy to clean and perfect for an evenly baked cake out of the pan. Great for cakes and pull-apart breads. It will hold 10 cups, so not a small bundt pan. 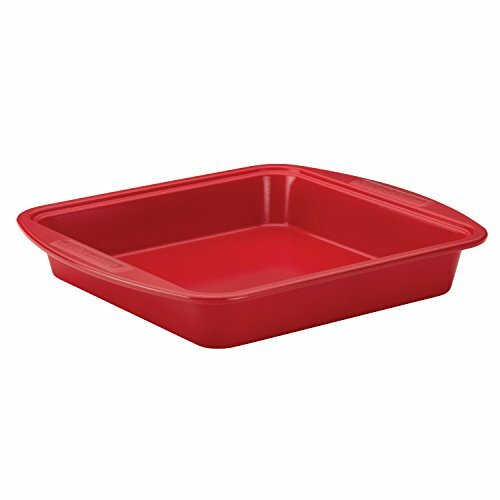 This pan comes in red or blue and is constructed with a double coated ceramic surface over a 0.7 mm steel interior and is said to withstand up to 536°F oven temperatures. A good size. Easy to clean by hand. No greasing of pan required. Baked items just slide out. Avoid soaking. Do not use in the microwave. Not for the dishwasher…though these are so easy to clean by hand, why would you? Exterior of pan will mark with use. 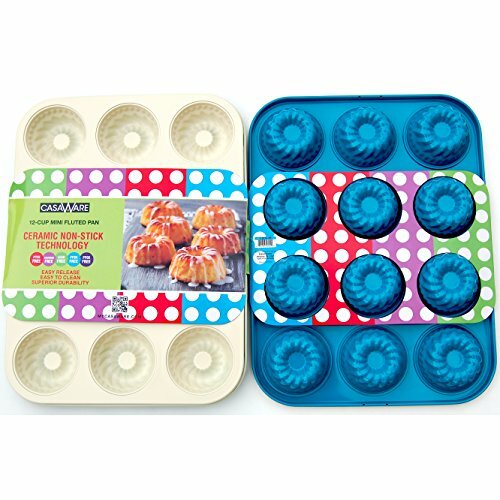 There is also a mini fluted cupcake pan that matches. What is Hybrid Ceramic Bakeware? This is a name used by brands such as Silverstone and Farberware, both owned by Meyer 1. It refers to the non stick ceramic coating applied to their bakeware. Hybrid ceramic comprises a coating of ceramic blended with a silicone base so it doesn’t crack or chip with the flexing of the bakeware. It is a traditional nonstick coating for bakeware and involves silicone polyester with the ceramic coating. Like other non stick ceramic, it is rated as PFOA and PTFE free. To lengthen the life and enjoyment of your best baking pans, consider whether they have a non-stick coating, which can be worn from metals that scrap the surface. 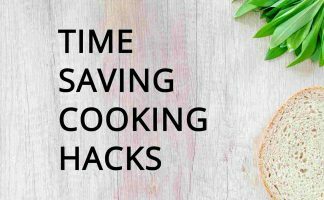 If so, you need to avoid using metal utensils when filling or emptying those baking pans. Always use baking tools, spoons and spatulas, that are silicone, plastic, wood, nylon, or bamboo with your baking goods when using non stick ceramic baking dishes. The same care when cooking is needed when you are cleaning these nonstick bakeware dishes. The nonstick cookie sheet pans and cake pans, like all nonstick ovenware, are super easy to clean and keep clean. So avoid using harsh scourers. Just wipe with a paper towel or a wet cloth. Avoid placing them in the dishwasher as they could get damaged by the swinging arms of the dishwater or the utensils placed inside. Do you have a favorite ceramic pie dish? When storing, keep them separate or if you do nest them inside each another, make sure to use a separator, either a cloth or paper towel. You can also purchase pan protectors on Amazon.com for varying types of cookware. This will to keep them smooth and free of scratches. Where To Shop Online for Ceramic Bakeware? You can find bakeware on Amazon, which is especially great if you are a Prime customer. You can also check out Ceramcor for their 100% ceramic cooking ware. What is the Best Bakeware? I hope the above guide has been a help. I’d love to hear what you’ve found to be the best bake ware or the best bakeware brand.